I've had cupcakes on the brain for the past couple of months. First a cupcake won the Cooking Light Reader Recipe Contest. 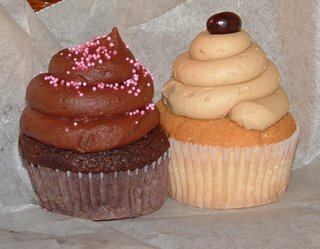 Then I had fabulous cupcakes while I was in Charleston for the Southern Living contest. SL gave us each a gift bag with two cupcakes when we arrived, and they also served them backstage during the show. The cupcakes were from a new bakery in Charleston called Cupcake, and two of them are pictured here. I sampled, um, a few, and all were fabulous, although they had a little too much frosting for me -- and I thought there was no such thing as too much frosting. So when I went to a ladies' card night on Friday, I offered to make cupcakes. I decided to make Martha Stewart's recipe for pumpkin cupcakes. They were tasty, although the texture was a little heavy, like a muffin; I would have preferred a fluffier texture. I also didn't like the idea of using two sticks of butter. Here's the recipe. 1. Preheat oven to 350°. Line cupcake pans with paper liners; set aside. In a medium bowl, whisk together flour, baking soda, baking powder, salt, cinnamon, ginger, nutmeg, and allspice; set aside. 2. In a large bowl, whisk together, brown sugar, granulated sugar, butter, and eggs. Add dry ingredients, and whisk until smooth. Whisk in pumpkin purée. As for the frosting, it was something I was experimenting with, and quite frankly I can't find my scribbles on what I did. But as I was Googling the Cupcake bakery, I found an article with several of their recipes, including one for pumpkin cupcakes. They use a cinnamon cream cheese icing, which I'm sure would be very tasty. Here's a link to the article. If you try any of the recipes, please post a comment and tell me how it was! Thanks for the link! Every flavor of those cupcakes were fabulous.